In this edition, we’re going to take a look at making an impression with men’s shoes. Portland and other larger cities are home to a more sophisticated level of professional dress. This article will reveal some of the tips that will help you to present your strongest image with proper attention and care to your footwear. You’ll also discover a brief history of how mens shoes built the modern world. Then back to Portland for a look at local sports and business. It’s all the time important for any man who has a sense of fashion to have several different pairs of footwear that may match the various different occasions. And we are offering some tips on choosing men’s shoes. A few weeks ago we took a look at buying a nice pair of boots; but how do we know if we’ve got a good fit or not? Most men haven’t considered their sizing. It’s the second coming of open source in Oregon, which may now be paying economic dividends. Este’s Men’s Clothing is the only store in the Portland area that offers the complete Allen Edmonds and image consultant to come to your home or office. Use Shoe Trees – It may sound a little old fashioned but investing in good unvarnished shoe trees is still a must do. The varnished ones look swanky but they are not good at drawing moisture (sweat) out of the worn shoes, part of the purpose of a shoe tree in the first place. The crucial time to use shoe trees is right after they have been removed and they should remain in place for at least an hour or so. After that, the shoes will have returned to their natural architecture and the trees can be removed. Wet Shoes – If you have been caught in an unexpected downpour and your precious shoes are soaking wet you need to act promptly if you are to save them from permanent damage. The best way to do that is stuff the wet shoes with newspaper and dry them away from direct heat. Direct heat often dries leather far too quickly causing them to crack – and nothing can save them if that happens. Before the shoes are completely dry insert the shoe trees to make sure that they return to their proper shoes. Polish the Right Way – As the staff at any good shoe stores in Portland can tell you there is a right and a wrong way to polish your shoes. Before you begin, wipe off your shoes down with a damp (not wet) cloth to remove superficial dirt and stains. When applying the polish do so in a circular motion but there is no need to be gentle, the more you rub, the better. For extra shine, hold the shoe between your knees and buff the toe vigorously with a lint-free cloth. For all the jokes about women and their shoe obsessions there are just was many men who understand the importance of a well-designed, well-made shoe to ensure that their chosen outfit for the day is complete. Gentlemen who watch their appearance know that a terrible pair of shoes can ruin even the most stylish of outfits. 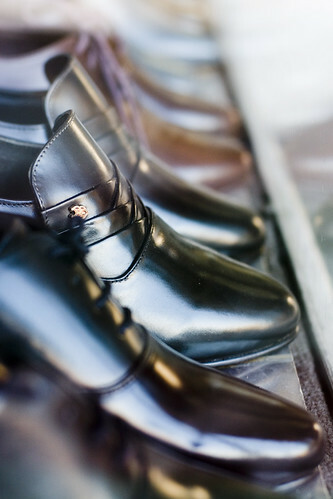 When seeking great shoes stores Portland has a few to offer, if you know where to look. One of the more stylish shoe options that can really set a man apart are exotic shoes. Exotic shoes are made from animal hides such as crocodile, lizard and even ostrich. 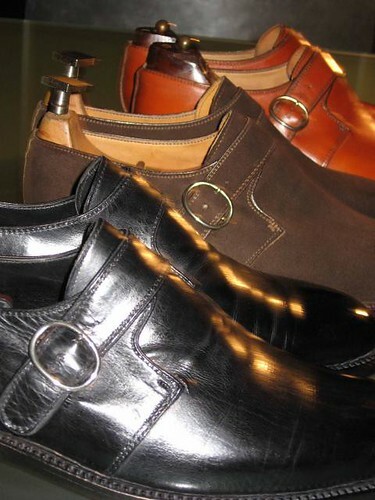 The best of these kinds of shoes are made to order, so that each pair fits their owner like the proverbial glove. New York and LA have stores offering this fashionable footwear but one might not think that when it comes to such shoe stores Portland might have none to offer, but there is one, Estes Men’s Clothing in the ever fashionable Pearl District. For those seeking a more conservative but equally stylish look the Allen Edmonds line of fine shoes has been chosen by no less than eight American Presidents and countless successful media personalities and businessmen. The only full line offering available to those living in the Portland area is carried at Estes Men’s Clothing where they are expertly fitted by a highly trained and knowledgeable staff. If the idea of shopping at one of those “discount designer warehouses” appeals to you then when discussing shoe stores Portland has plenty of that type to offer as well. The problem is that the shoes that looked like such a great buy on the shelf tend to wear badly and last for just a few months, as the workmanship that went into their construction was not quite up to the high standards one might have expected. Shoes are a necessity, not just a fashion item and taking the time to shop for a pair that is of the best quality is really the only sensible course of action for the well turned out man.